Pay-and-display parking is available in Horton’s national park car park with good toilets near the bridge by the Crown Inn (still marked on OS maps as the New Inn), but there are also places to park either on the streets or the large layby at the southern end of the village. Take the track leading up the side of the village shop, formerly the post office and take the left-hand route where it forks, signposted Horton Scar Lane. 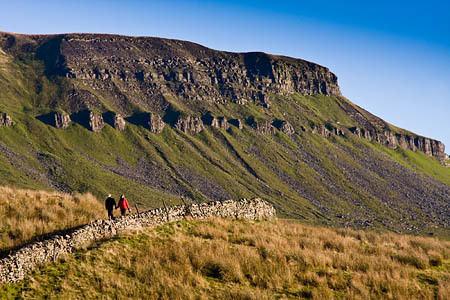 The track climbs gradually, with good views of Pen-y-ghent to the right. After the gate at Tarn Bar, the main Pennine Way path to the summit turns sharp right. At this point, a 300m detour can be made to see the remarkable chasm of Hull Pot. Continue straight on along a sometimes wet green path leading to the pot, a huge, 90m long, 20m wide and almost as deep, reputedly the largest natural hole in England. There is no walker’s route into the bottom and even climbers have to abseil into the opening, so be warned: don’t fall in! 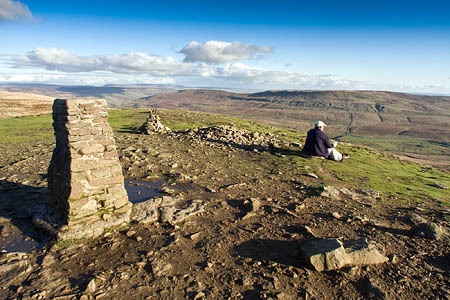 Retrace your steps to rejoin the main Pennine Way path at Tarn Bar, turning left up the slope. The path, easily followed even in poor visibility, rises steadily over moorland until it dog-legs to the right at the base of the limestone pinnacles and crags that mark the start of the change to the gritstone and shale cap of the mountain as the path leads diagonally up towards the summit ridge. 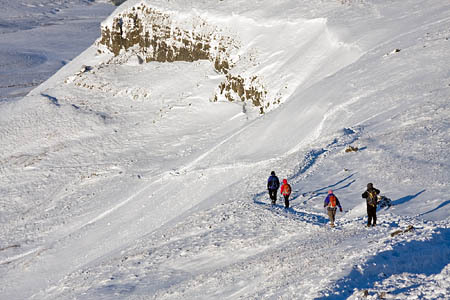 In winter, this section holds a snow field longer than any other section of the route and will be covered in névé in harsh seasons. For the rest of the year, it’s just a straightforward plod uphill, with a gradual turn leftwards and the final 300m rise to the ridge wall with its shelters either side. The trig point and a small cairn are on the south-eastern side of the wall. For a descent retrace your route or, for variety, use the Brackenbottom path which involves an easy scramble down the southern nab of the hill, though the rocks can get slippery when iced, and be aware that the nab encounters the strongest winds on the hill and progress can be difficult when gales hit Pen-y-ghent. For a longer return to Horton, reverse the route via Plover Hill, if time and daylight allow. Ordnance Survey mapping and route data for this walk can be found on our grough route system. Key in Pen-y-ghent to the keyword search.